You applied for the job and now want to check on the hiring process and your materials. Reach out to your contact, if you have one. Ideally, you had a contact inside the organization through whom you learned about the job, says Jenny Foss, founder of the career blog JobJenny.com. In that case, email him or her to ask about the hiring progress. 1. Contact human resources or the hiring manager. Jenny Foss of JobJenny.com says that for larger companies, candidates should contact someone in human resources who is involved in hiring for your prospective department. An email or phone call would do, she says, to get an idea of the hiring timeline. Say you applied to a smaller company, or to an actual person. Mary Ellen Slayter, Monster’s career advice expert and founder of the marketing company Reputation Capital Media Services, suggests emailing that week to say something along the lines of, “I sent over my résumé and wanted to know if you have any questions. I’m very interested in the position.” Foss adds that in emails, you should always thank this person for his or her time in responding to you. 2. Email a few – not 10 – more times. Your following up paid off, and you landed an interview! Now that you’ve met with the team, reach out again to send a thank you. 3. Follow up fast – like now. Foss advocates for emailing the interviewers as soon as you can, as in, from the parking lot of the employer if you have your laptop and a wireless connection. “Thank yous matter a lot, and I think it’s unexpectedly impressive if, an hour after you left the building, they’ve got a thank-you note that’s genuine and specific sitting right in front of their face,” she says. A mass “thanks for your time” message won’t cut it. Copying, pasting and sending the same email to each person won’t impress anyone, either. Foss and Slayter each stress the importance of sending an individualized email to every person, so be sure to take notes on everyone and grab business cards after the interview. In each email, thank the interviewer for his or her time, Slayter says, and then “add value and move the conversation forward.” Say you and this person spoke about the company’s venture into search-optimizing its website. Mention this conversation, and point to an example of your experience with that topic. As for length, Slayter suggests keeping the message to a paragraph or two. 5. 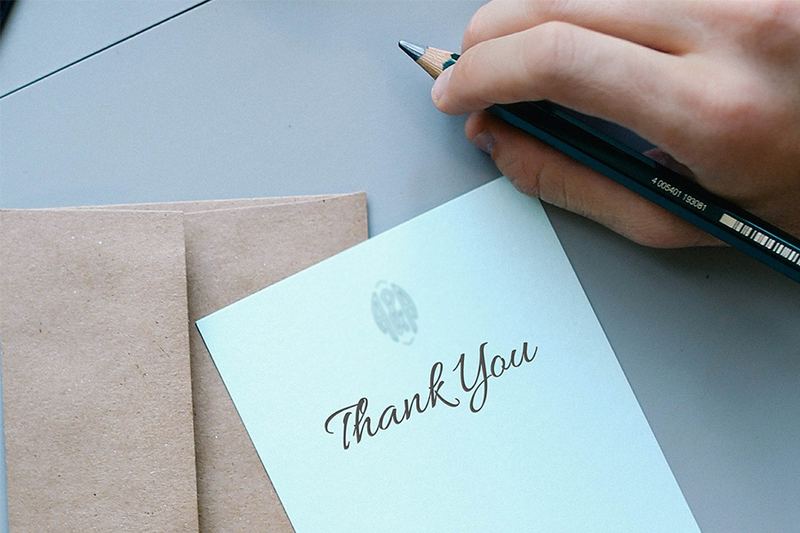 Consider sending a snail mail thank-you note, too. Slayter and Foss are of the camp that the individualized message and quick delivery of an email typically trump cards, which are well-meaning but sometimes impractical. Consider the timing of the hiring decision. If the interviewer says he or she will make a decision within a week, your thoughtful card may still be in transit come D Day. In any case, if you do send a handwritten note, be sure to send that personalized email first. That way, your interviewers will definitely receive your thanks before they make a hiring decision. Bummer. You didn’t get the job. Gottsman points out that following up and restating your interest in the position – assuming you have such interest – may help you in the long run. If you and another candidate were neck and neck, and the person hired doesn’t work out, the employer has an open line of communication with you and knows you’re still interested. Or maybe other relevant positions in the company open up. Now that manager will think of you.